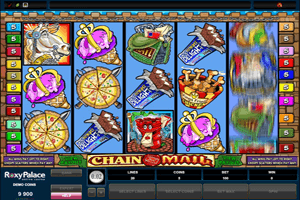 Chain Mail is a medieval themed 20-paylined video slot machine that will invite players to go on a great journey back in time to the medieval era, to the time the kings ruled the lands and the knights served their needs. The game comes with a twist though, as instead of the serious Kings and Knight theme of most medieval themed slots, it is about fast junk food in the medieval times, this is why it is called Chain Mail. Play Chain Mail Slot here. This is also why players will see plenty of symbols that are inspired by the fast food industry such as friend chicken, a chocolate bar, ice cream, pizza on a pike, a horse, a mail bag and much more. These symbols will spin on the game’s 5 reels and the 20 lines that the game has, before players can spin these reels, they will have to place their bets at the bottom of the reels through the control panel. The game comes packed with a great amount of rewarding features and symbols, which is not a surprise since the game is powered by none other than Microgaming. The wooden basket with the B letter on it, it will trigger the Castle Bonus round. The logo of the game is the wild icon that will substitute for other icons to help players get paid plus doubling any payouts that it contributes in creating.